Microsoft buys Nokia's smartphone business, cements also-ran status. 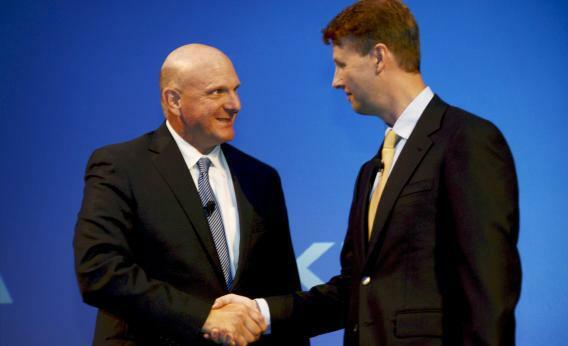 Microsoft CEO Steve Ballmer shakes hands with Nokia chairman Risto Siilasmaa after Nokia announced the sale of its mobile phone unit to Microsoft for $7.2 billion, bringing to an end its days as a phone maker. Microsoft is buying Nokia’s devices and services business in a bold, $7.2 billion bid to cement its status as an also-ran in the smartphone marketplace. The Redmond giant once dominated the software industry but was late to the mobile-software party and was rapidly surpassed by Apple and Google. In the Nokia deal, it acquires a business that once dominated the smartphone industry but was rapidly surpassed by Samsung. Synergies, indeed! When the deal closes in early 2014, Microsoft will get Nokia’s whole smartphone business, including the Lumia brand, plus its mobile phones business, which includes the low-end Asha brand popular in India and some other developing countries. It will also get licenses to the Nokia brand, patents, and mapping services. Nokia, meanwhile, will retain ownership of its brand as well as its mapping, networking infrastructure, and R&D divisions. As the Verge notes, it will become a much smaller company, though also perhaps a more sustainable one. Microsoft, meanwhile, will go from being a minor afterthought in the mobile devices and services world to a much larger afterthought. Google, Apple, and Samsung may not exactly be quaking in their boots this morning, but BlackBerry is pretty much screwed. Microsoft’s shares fell 5 percent on the news, while Nokia’s soared 35 percent.